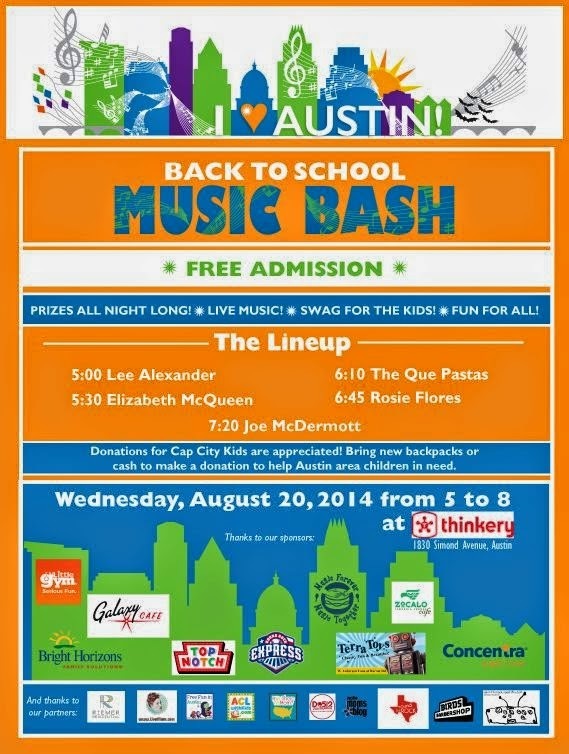 Austin Summer Fun: See You at the Back to School Music Bash! Do your kids have the back-to-school blues? Does the end of summer feel like a major bummer? Then let's squeeze in one last BIG PARTY before they head back to class. 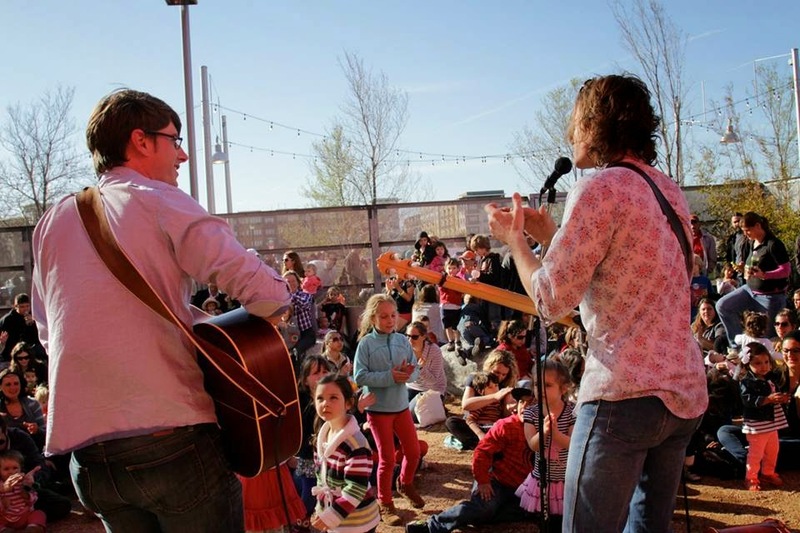 Join us at the Back to School Music Bash on August 20th at the Thinkery to celebrate the last hurrah of Summer 2014! 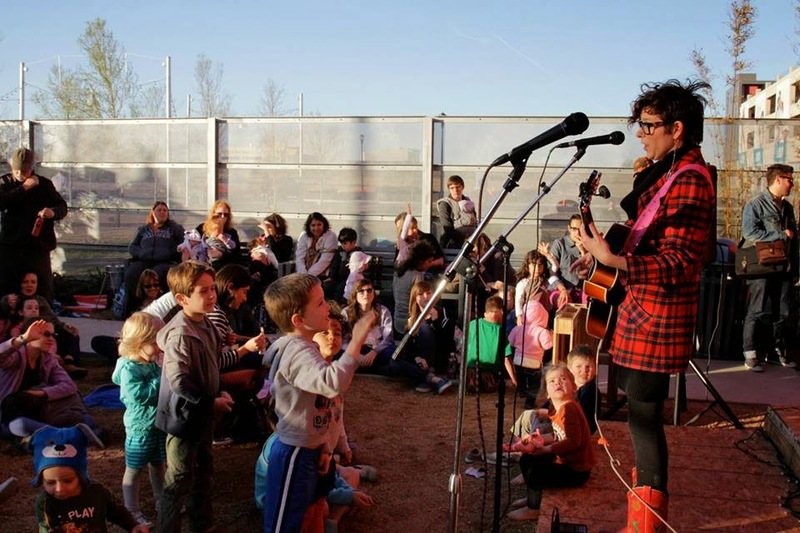 You can count on live music, prizes, swag for the kids, entertainment, food and fun for all! Admission is FREE, but we invite you to take this time to lend a hand to those in need. At the event we'll be taking donations of new backpacks and/or cash that will be donated to the local charity, Cap City Kids. Where? The Thinkery (1830 Simond Ave, Austin, Texas 78723). The party will set up in the courtyard next to the Thinkery's playscape. 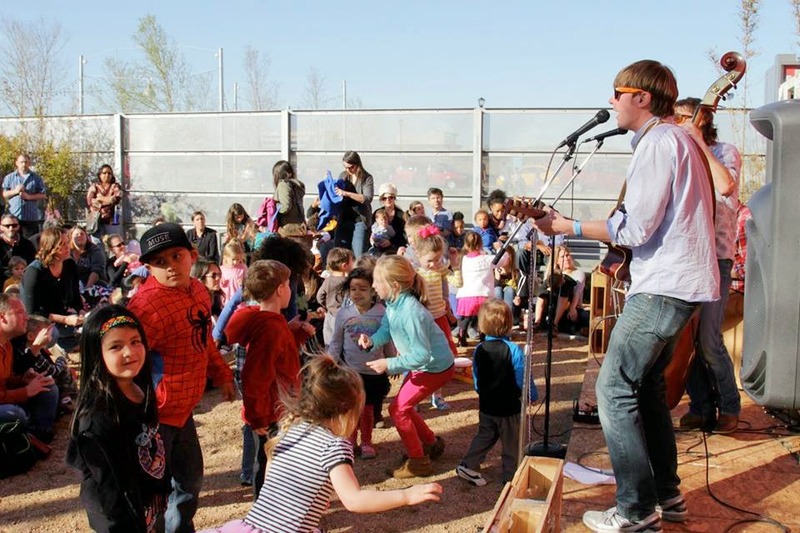 While the bands will be playing inside the courtyard, there will be plenty of activities on the grounds outside, too. And there will be lots of giveaways! During the set breaks between bands, we'll be drawing names for amazing prizes from our sponsors, including free hair cuts from Birds Barbershop, gift cards to Galaxy Cafe, Zocalo Cafe and Top Notch Hamburgers, toys from Terra Toys, and much more! Yes! Galaxy Cafe will be on hand with a great assortment of food including wraps for the grownups, mac 'n cheese and pb & j for the kids, and drinks for sale. Plan on treating yourself to a night off of cooking with something delicious from our friends at Galaxy Cafe. (And while you cannot redeem your free kids meal from the Austin Summer Fun Checklist at this event, don't forget to pop into one of their three locations by the end of August for that prize.) And if you prefer to simply pack your own picnic, you can plan to eat at Mueller Park nearby. Wow, the free Eventbrite tickets for this event were distributed in a flash! If you were lucky enough to snag one, print your tickets to bring along (or show them on your phone when you arrive). If you missed out on the tickets, don't worry. You can still come out and enjoy the party outside of the courtyard. You'll surely be able to hear the music, and depending on capacity, there's a great chance you'll still be able to get in if other families exit early. When you arrive, come to the side of the Thinkery by the playground. You'll check in at a table near the courtyard, show your ticket, and each child will get a complimentary raffle ticket before entering the gate. Besides your ticket, you may wish to bring a blanket to sit on (because bench space is very limited). The event will be partially tented, but bring sunscreen to play it safe. Bring water to stay hydrated (but no outside food). Also, if you have completed your Austin Summer Fun Checklist for Kids, bring it along for an EXTRA raffle ticket for the prize drawings! Oh, and don't forget your dancing shoes, of course. Rules... Capacity issues and fire codes mean that we are limited to the number of people we can allow within the courtyard. Please understand that we wish we could let everyone in, but we'll appreciate your patience as we pay attention to crowd management at the event. Also note, because of these such capacity issues, visitors will not be able to walk freely from the courtyard directly into the Thinkery. You will need to leave the event in order to go into the museum's front doors. Bathrooms...There is a bathroom in the courtyard. There are also bathrooms within the Thinkery as well as at Mueller Park across the street.